And you know what? He’s right to bring it up. I should have looked into it sooner. If there was an attempt by STA to fool the public by playing games with the data, that would have been an important issue to write about. And if there was a misconception that STA was trying to fool the public by playing games with the data, that would have been just as important to write about. But as STA considers whether to again ask voters for a tax increase – after a proposed three-tenths of a percent increase in the sales tax narrowly failed in the spring – it’s still a very relevant question. So I listened to Mumm’s full statement and to understand what she was getting at. And no, she wasn’t accusing STA of fraud. The clip that had been shared on the “8th Man” Facebook page was only a minute long and cut off most of Mumm’s answer. The longer clip cuts off the question Mumm’s replying to, but gave more insight into Mumm’s answer. I called Mumm and contacted STA to get some clarification, and sat through today’s STA board meeting to get some additional context. In reality, Mumm wasn’t referring to fraud, conspiracy or deceit, she says today. What she was referring to might be kind of boring, but is also pretty important when it comes to budgeting. Any business, agency or family developing a budget has to make two predictions: What do you think your revenue will be? What do you think your expenses will be? If you’re too optimistic about the future, that’s a problem. You could find your expenses outstripping your revenue and have to scramble to rebalance your books. Promises you made to the public, clients, or children may have to be broken. But if there are also problems with being too pessimistic about the future. You may miss out on important investments or opportunities to improve the quality of your service. You can get a pretty decent idea of your revenue by looking at the historical trend. What has your revenue been in the past? How fast has it grown? But a lot of financial managers like to err on the side of caution, projecting a more conservative revenue growth and pouring excess into reserves. That can put their business in a better position should something awful happen like, say, the collapse of the housing market out of nowhere. That’s exactly what STA was doing. 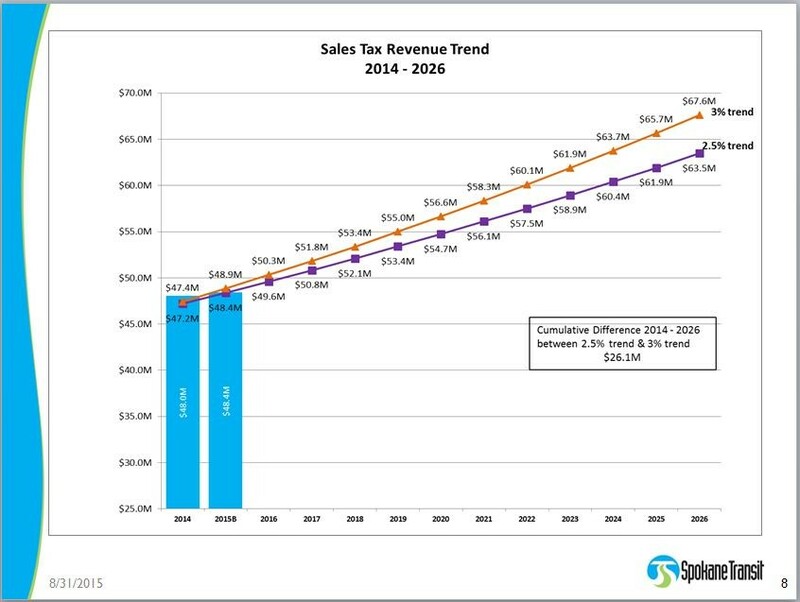 The historical growth trend suggested sales tax revenue would grow at 3 percent, but STA was only assuming sales tax would grow at 2.5 percent annually. That sort of move is not unusual, but Mumm disagreed with it. I reached out to Brandon-Rapez Betty, an STA communications specialist who was also at that community forum, and he confirmed Mumm’s interpretations of her remarks. Looking back, she says, “monkeyed” wasn’t quite the right verb. “Adjusted” might have been better. And she said her characterization as one projection as “fake” and one projection as “real” was not accurate. Neither number was fraudulent. Asked if she thought it was an attempt to swing this spring’s ballot measure to ask for a 3/10ths of a percent sales tax increase, Mumm didn’t think so. Spokane Valley Councilman Ed Pace, a fan of the STA’s efficiency but not of asking for taxes, was not as generous in his reading of the STA board’s intent. Neither Pace nor Mumm were on the board when the 2.5 percent growth number was adopted. Al French, voted yesterday to once again be the chair of the STA board, says there was a very good reason for erring on the side of being too conservative. When I mentioned the “monkeyed with those numbers” controversy to French he pantomimed banging his head against a nearby wall. Over the past year, meanwhile, there’s been a lot of debate over what that number should be. Many of the board members met with their financial advisors, Mumm says, about whether a more optimistic number would be appropriate. And at the same time, the economy started looking better. “We now have rosier numbers,” Mumm says. “We have more tax revenue. Expenses are lower. Gas [prices] are lower.” Not only that, but the legislature passed a transportation budget pouring more funding into transit projects in Spokane. In October, the board voted to start assuming revenue would grow at 3 percent annually with the 2016 budget. “We are adjusting our forecast to be more in line with the historical trend,” Mumm says. They still, however, are projections. They could be right or they could be wrong. And with that trend, STA calculates they could do everything they’ve laid out in their “Moving Forward” plan with a two-tenths of a percent a sales tax increase, instead of the three-tenths percent increase that failed last spring. At today’s STA board meeting, the board began debating whether to ask voters, again, for a sales tax increase, and how much of an increase to ask for. Cheney Mayor Tom Trulove, Liberty Lake Mayor Steve Peterson, and Spokane Valley Councilmen Chuck Hafner and Ed Pace were skeptical of asking voters, again, for a tax increase. At least not so soon. Not only that, but explaining to voters they’ll get the same deal for a smaller tax increase could require a complicated explanation. The STA board also asked the STA staff to analyze how much they could get for a one-tenths of a percent sales tax increase. STA board chair, member: Future of the Plaza isn't "dim"